Hello everyone, I'm back with another card today. To start the card I took a Neenah Solar White card base cut to 4" x 5 1/2". I then took my Simon Says Stamp Moroccan Stencil and adhered it down over the card base with painters tape. I then used four different coloured distress inks - seedless preserves, peacock feathers, evergreen bough & mowed lawn and inked over the stencil using a mini ink blending tool. 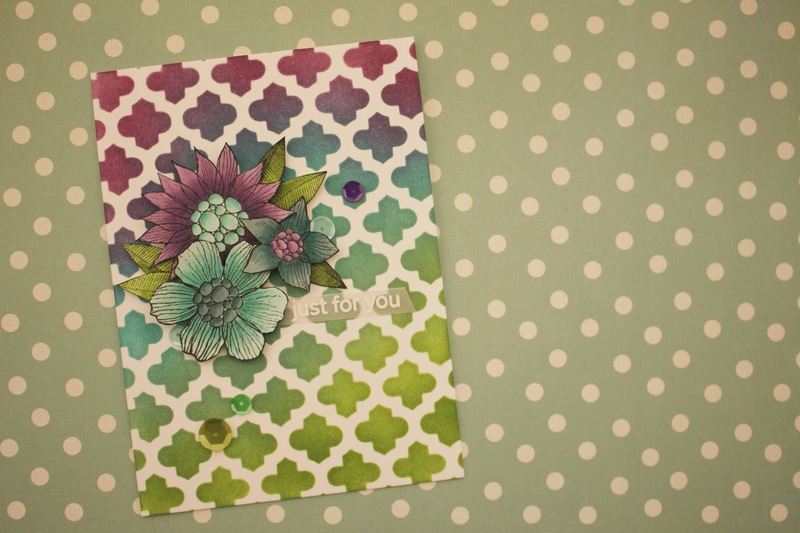 Once the background was completed I took the Simon Says Stamp ft Mama Elephant stamp set called Summer Garden and stamped the flowers and leaves on some card stock and coloured them in with copic markers (all colours will be listed below).